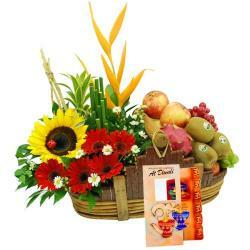 Product Consist : Basket arrangement of 25 Colorful Roses and Basket of 5 Kg Fresh Seasonal Fruits along with Assorted Fire crackers (Worth Rs.300/-) (Note: Types of Fire Cracker are depends upon their availability no specific choice). 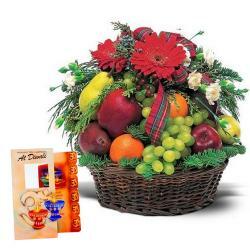 Gifting flowers is the most special thing to do for any festival or occasion as flowers are so fresh and fragrant that they have the capacity to charm anyone. 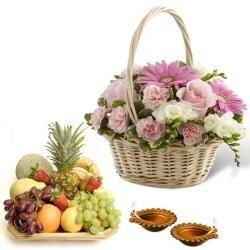 This hamper has a beautiful blend of mix Roses arranged in a basket to make the flowers look spectacular. Along with the fresh fruits for healthy smile we have also put together a collection of desirable crackers to delight your dear ones this Diwali. 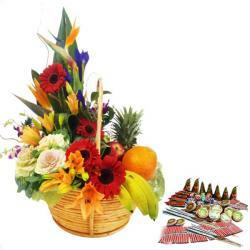 Make anyones day special with a thoughtful combination of flowers fruits and crackers. 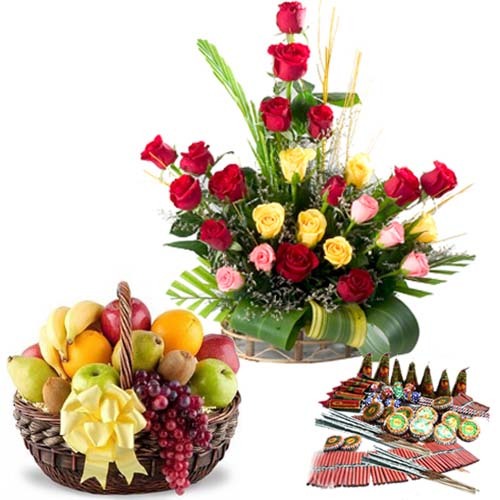 Product Includes : Basket arrangement of 25 Colorful Roses and Basket of 5 Kg Fresh Seasonal Fruits along with Assorted Fire crackers (Worth Rs.300/-) (Note: Types of Fire Cracker are depends upon their availability no specific choice).